Preheat oven to 325°. Make the tart shell. Place the bacon in a sauté pan, cook bacon until crisp over medium high heat. Remove the bacon from the pan and let sit on paper towel to remove excess fat. Pour out the excess grease, retaining 2 Tbsp in the pan. Add the leeks and cook until they soften, then add mushrooms and sauté until golden brown. Remove from the heat and cool. 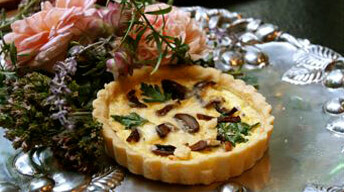 Add the cooled ingredients to prepared tart shell and sprinkle with cheese. Pour in custard, filling just below top of tart pan and bake for about 35 minute or until golden brown and filling is set. Note: Tart can be made 1 day ahead and reheated in a 300° oven for about 30 minutes. Just cover loosely with foil for the first 20 minutes. In medium bowl combine flour and cut butter into flour until cornmeal texture. Add egg and combine, do not over mix. Roll out dough about ¼ inch thick and place into tart pan. Press to fit in the pan, then trim the excess dough so sides of pan are clean. Refrigerate. Combine all ingredients in blender. Refrigerate.